A record 22 Pinot Noirs claimed Gold Medals at the 2018 SavorNW Wine Awards competition conducted February 26-28 in Cannon Beach, Oregon. The wine competition featuring only Northwest wines from Oregon, Washington, Idaho and British Columbia totaled nearly 700 entries including 74 Pinot Noirs. The 2015 vintage Pinot Noirs accounted for 11 Gold Medals with entries including vintages from 2013-2016. Walnut City Wineworks claimed Best of Class honors for their 2016 Willamette Valley Pinot Noir. Freja Cellars earned a Double Gold Medal for their 2013 Winemakers Reserve Pinot Noir and a Gold Medal for their 2015 Estate Pinot Noir. Lumos Wine Co, claimed two Gold Medals for their 2015 Five Blocks Pinot Noir and 2015 Temperance Hill Vineyard Pinot Noir. "The number of Pinot Noirs that collected Gold Medals was surprisingly high," said Gary Hayes, executive director of the SavorNW Wine Awards. "Typically Gold Medals are awarded to only the top 10-15% of the wines entered, but the success of the 2015 vintage of Oregon Pinot Noir could be attributed to an exceptional growing season that year. The harvest was the earliest on record for many wineries in the Willamette Valley and a cool September allowed winemaker's to harvest at what they considered to be optimum ripeness. Wine Spectator's Harvey Steiman wrote in October of 2015 that the vintage could be the state's most extraordinary and the SavorNW results could be further evidence of that," Hayes added. The largest number of Gold Medals for any winery in the competition went to Southern Oregon's Reustle Prayer Rock Vineyards who earned six Gold Medals including a Best of Class for their 2016 Gruner Veltliner Smaragd and a Double Gold medal for their 2016 Syrah. Reustle's 2015 Syrah, 2015 Winemaker's Reserve Syrah and 2015 Winemaker's Reserve Pinot Noir also collected Gold Medals. Two Washington wineries claimed four Gold Medals each at the competition. Sinclair Estate Vineyards from Walla Walla earned Gold Medals for their 2014 Merlot, 2014 Pentatonic red blend, 2014 Syrah and 2014 Vixen red blend. Comforts of Whidbey from Langley, Washington won Gold Medals for their cool climate grape varietals from Puget Sound including their 2016 Madeleine Sylvaner, 2016 Sparkling High Tide White, 2016 Sparkling Siegerrebe and their 2017 Late Harvest Semillon from Columbia Valley. British Columbia's top awarded winery was Larch Hills Winery who earned four Gold Medals including Best of Class honors in the Other Whites category for their 2015 Siegerrebe and Gold Medals for their 2015 Ortega, 2016 Lemberger and 2016 Tamarack Rose. 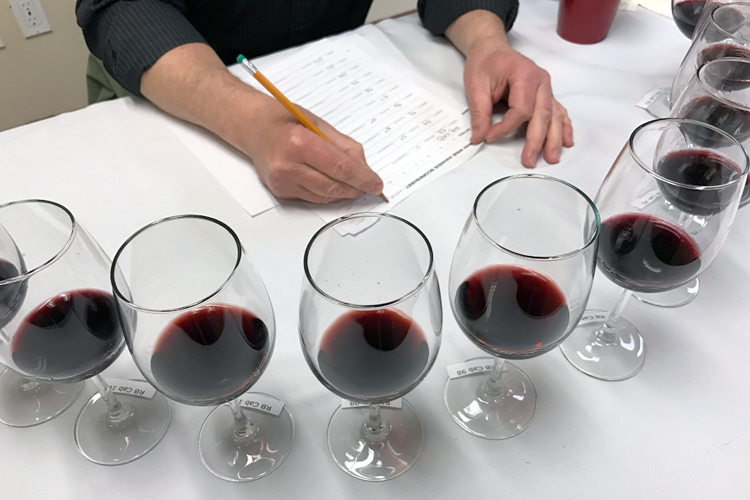 The SavorNW Wine Awards competition is an annual blind tasting of Northwest wines where the professional judges only know the varietal they are evaluating. For a complete list of winners, follow the link below.